Under the motto “Pioneering Underground Together”, at bauma 2016, the world's largest construction machinery trade show, Herrenknecht is presenting the latest in tunnelling technology and references from new dimensions of tunnelling projects. Herrenknecht machine technology and services are convincing thanks to outstanding quality, reliability and consistency, for all project profiles and areas of application. These include the construction of tunnels, shafts and galleries for roads, railways and subway systems, as well as for supply lines, hydropower plants and mines. The latest technology for the laying of pipelines and the development of oil and gas resources rounds off the product portfolio. Only recently, tunnelling teams have been tackling more demanding projects than ever before. They represent essential elements of new infrastructures and will soon contribute to improving the quality of life for millions of people as well as more environmentally-friendly handling of natural resources. The Emirate of Qatar in the Persian Gulf is designing an ultra-modern metro network from scratch with four lines in its capital city of Doha. In just under three years, four international joint ventures are building 111 kilometers of tunnels for Qatar Rail using 21 Herrenknecht machines. Even timely delivery of machinery and accessories to jobsites under demanding import specifications represents a masterpiece of logistics. Peak times see fully-loaded ships setting sail from Antwerp to Qatar every two weeks. Herrenknecht is available on site around the clock providing support in the form of services ranging from machine assembly through tunnelling to disassembly. With 45 intermediate openings and 31 final breakthroughs, this is a project of unique planning and operative complexity which is only possible through close collaboration by everyone involved. More than 90% of the route has already been covered within the specified time schedule and budget. Real teamwork and high-tech offered by Herrenknecht merge Asia and Europe under the Bosporus: over a period of 16 months, a Turkish-South Korean joint venture has been excavating a 3.34-kilometer tube under the sea using a Mixshield diameter of 13.7 meters. At water pressures of up to 11 bar and through changeable, wear-intensive subsoil. The machine team has exchanged 400 disc cutters and several cutting knives at depths of up to 106 meters under the Bosporus. Under maximum safety conditions and atmospheric pressure via an accessible cutting wheel. Thanks to pioneering technology and ideal collaboration between all project partners, the tube shell was completed on August 22, 2015. As of late 2016, around 100,000 vehicles will be travelling through the Eurasia Tunnel from one continent to another, decisively relieving chronic traffic conditions in Istanbul. On the open area north, Herrenknecht presents technology up close for drilling techniques in all directions: the Boxhole Boring Machine for vertical drilling, the Slant Directional Drilling Rig – a combination of horizontal and vertical drilling techniques – and newly-developed boring tools for attributing the decisive edge to horizontal boreholes. On an area spanning 1,506 square meters, the Group is showing how innovative collaboration between clients, contractors and tailored tunnelling technology redefines the limits of what is possible in mechanized tunnelling. 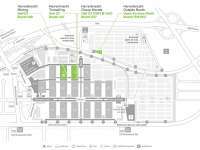 Meeting point at Messe Munich, April 11-17, 2016, in Hall C3, 447. 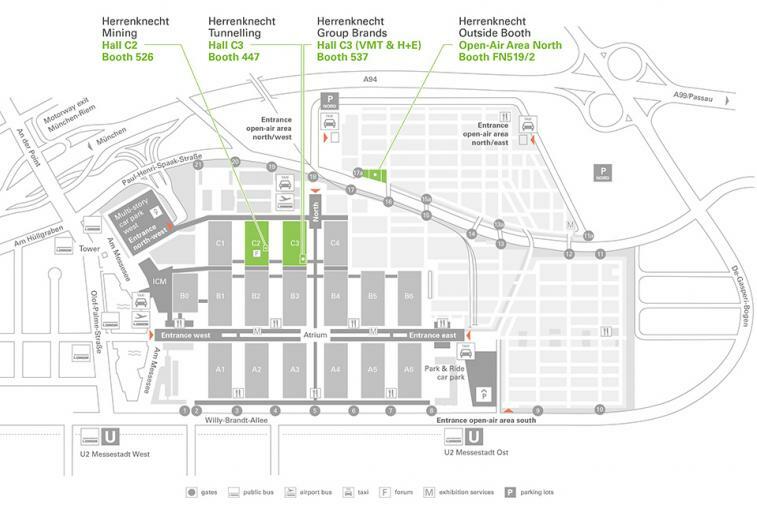 In addition, Herrenknecht technology live on the open area North, a separate booth for Herrenknecht Mining and a joint booth by Group brands VMT and H + E Logistik. April 8, 2016 Munich / Schwanau At bauma 2016, Herrenknecht is focusing on innovative collaboration between contractors, consultants and clients. From April 11 to 17, 2016, trade visitors can obtain a multimedia insight into last year's most exciting tunnel projects – and discover the team spirit exuded by site crews in line with the motto of “Pioneering Underground Together”. Collaboration based on trust is the decisive factor for success when it comes to reliably concluding projects. 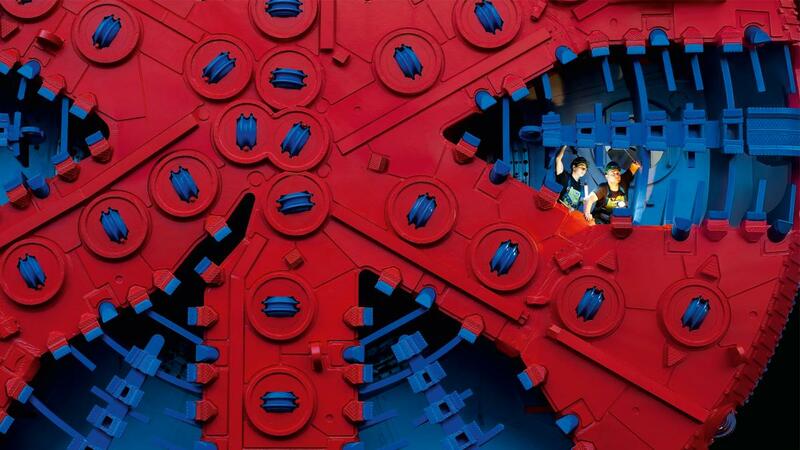 On average, four Herrenknecht machines somewhere in the world achieve a breakthrough in tunnelling every week. With Herrenknecht as a premium partner, construction companies ensure progress underground 365 days a year. More than 3,000 projects concluded in various diameter ranges and geologies serve as references. Over several projects, Herrenknecht premium technology can achieve top performance accompanied by maximum safety with the cradle-to-cradle approach considered as early as the design phase. Owing to the high manufacturing and product quality as well as modular design, individual components and parts through to entire machines can be reused after project completion on the basis of professional remanufacturing. Specific adjustments to new project conditions are integrated in the comprehensive preparation process. The use of proven, reprocessed components reduces CO₂ emissions by up to 90% compared to those by a machine comprising new components. An advantage which can be included in the CO₂ analysis of the construction project. Slant Directional Drilling (SDD) unites the advantages of proven HDD (Horizontal Directional Drilling) and classic vertical drilling. 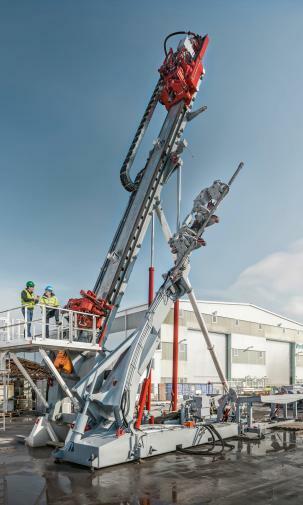 With the SDD Rig HK150C on display, teams can drill at angles of entry of 8 to 90 degrees to the surface of the earth. Herrenknecht offers a regular multi-tool which is eminently suitable for tapping near-surface energy reserves such as oil sands or geothermics. 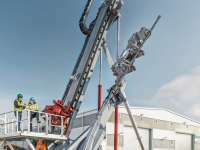 The crawler is distinguished by a high degree of mobility, low spatial requirements and short dismantling times, facilitating swift and easy drilling relocations for operators. Together with recognized HDD specialists, Herrenknecht has developed three innovative drilling tools for laying pipelines faster, more safely and less expensively: Weeper Subs in the drill rod ensure a balanced pressure level in the flush circuit during pilot bores and significantly reduce the risk of frack-outs typical during this process. The Full Face Hole Opener permits extension of the pilot bores to target size in a single work step. Using replaceable disc cutters, it can be used in various subsoils and can be refurbished or converted swiftly and inexpensively as required. The Down Hole Jet Pump can be installed directly behind the Full Face Hole Opener. It cleans the borehole and removes the excavated material within the drill rod, representing an innovation in the HDD. Drilling with the Hole Opener in combination with the Jet Pump swiftly achieves a round and clean borehole accompanied by reduced bentonite consumption. Herrenknecht developed the Boxhole Boring Machine (BBM) for producing vertical and inclined slot holes in underground mines. Its technology is based on the proven principle of mechanical pipe jacking. The BBM can be used in hard rock formations and even in very tight spaces thanks to its compact design. It permits drilling diameters of up to 1.5 meters with a maximum boring length of 70 meters and an inclination of up to ±30° from the vertical. The BBM offers miners improved safety at work, higher productivity and optimal mobility. At its outdoor booth N519/2, Herrenknecht shows a BBM1500 (diameter of 1,500 mm). All Herrenknecht products for creating infrastructures for mines are presented at a separate mining booth in Hall C2, 526. The equipment stands for high tunnelling output and occupational safety, enabling miners to produce vertical shafts, inclined shafts and horizontal tunnels in any geology. With diameters of 0.3 to 12 meters and max. depths of 2,000 meters, whereby proven process components by Herrenknecht are used which have been adapted for the mining sector. Vertical access or production shafts, access ramps, ventilation shafts or transport tunnels in mines – Herrenknecht offers the corresponding project-specific technology and services. The product range offered by Herrenknecht for tapping underground mines comprises Shaft Boring Machines (SBR, SBM), Raise Boring Rigs (RBR), Boxhole Boring Machines (BBM) and Tunnel Boring Machines (TBM) as well as Shaft Drilling Jumbos (SDJ) and Vertical Sinking Machines (VSM). In conjunction with its Group brands, Herrenknecht offers the entire range of tunnelling and process technology, services and additional equipment. The specific specialized subsidiaries complement the technical product portfolio in the upstream and downstream processes associated with tunnelling machinery. The Group includes: Herrenknecht Formwork (systems for segment production), MSD (rolling stock systems), Bohrtec (auger boring systems), GTE (site personnel), Euroform (formwork equipment), TechniMetal (multi-service vehicles) and Herrenknecht Vertical (deep drilling rigs).